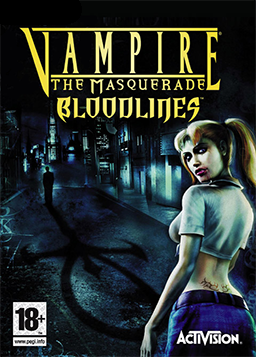 Vampire: The Masquerade – Bloodlines is set in White Wolf Publishing’s World of Darkness and draws a great deal from their RPG/LARP game Vampire: The Masquerade. Gameplay revolves around a newly sired vampire and the quest to expose the truth behind an ominous relic that may be the death knell for the immortal undead. Bloodlines allows players to experience the game in first or third person, join the vampire clan of their choice, assume that clan’s distinctive powers, customize combat style, and choose between resolving challenges violently or nonviolently. See also QRM’s entry for this game.